I’m delighted to share that my article, Grandchildren, Art & Grandmother Wisdom is in the new edition of Explore Awareness magazine in the April issue. My granddaughter and I have been holding Grandmother Camp for several years and its one of the delights of my life. If you are looking for a way to connect with your “Littles” perhaps one of the ideas I share in the article will spark an interest for you and your family. If you’d like more information about creating art, painting workshops, or social painting soirees, please send me your name and email address for a list of upcoming workshops and events. Leave a comment about what you are interested in learning. Today, March 8th, is International Women’s Day! We are celebrating the cultural, economic, social and political achievements of women and girls all over the world. We are calling into awareness the contributions, sacrifices, achievements, and suffering that women have made. I especially encourage people to talk with your daughters & sons, sisters & brothers, mothers & fathers, family & friends who may not be aware of this day and share stories of bravery and courage within your own families to carry on your lineage. Share information about women leaders, artists, scientists, warriors, writers, and peacemakers who have impacted our lives. A great resource is A Mighty Girl for books, articles, and posts to discuss. Dr. Clarissa Pinkola Estes, who is one of my mentors and author of Women Who Run with the Wolves, Myths and Stories of the Wild Woman Archetype, is releasing a 25th anniversary edition of her book with 15 pages of new writings. Here is a post from her facebook page on today’s celebration of International Women’s Day. I encourage you to read her post and her words, and her books! In addition, Emma Watson (our beloved Hermione Grainger from Harry Potter) has chosen this book for the March/April selection for her new book club, Our Shared Selves. Join me in celebrating Spring and the expression of love for your own body in a 13 step painting process. You need no experience in painting or art – simply the desire to be creative, share in a celebration with other women and explore with deep inquiry in how your body is a blessing. We will journey in imagination, move in joyful dance, use magic paintbrushes and cosmic canvases, write words in journals – all in a beautiful retreat center quietly tucked away in the beauty of Keswick VA. There will be time for painting, journaling, connecting, private thought & creative inquiry, as well as joyful movement, walks, and fresh air. Come join us and create an altar to the temple of your present self in healthy, happy ageless beauty, trust for the body you live in and release any old beliefs about perfection & body image. Let’s connect on a magical journey of transformation & healing using Intentional Creativity, with gentle encouragement toward abundance, deep inner knowing, & self expression. The retreat investment is $197 for Saturday & Sunday from 10am-4pm. All the supplies you will need are included: canvas, brushes, paint, music, delicious snacks and a community of like-minded women in community. Accommodations are available for anyone wanting to stay overnight with sauna, hot tub, Japanese bath, and beautiful water views and gardens. Visit Bridge Between the Worlds for more information and pricing. Bodywork may be available before and after the workshop times by appointment. Download the DivineDiva-Registration-Form for more details. We use Intentional Creativity as a method, following a number of steps to reveal hidden messages from your feminine soul voice, a connection to your inner wisdom & knowledge. I love how this work creates deep change, allowing you to walk with a renewed sense of yourself, excited about the next stage of your life. As we say goodbye to Carrie Fisher and her words of wisdom, we also congratulate Meryl Streep on her Cecil B. DeMille Award at the Golden Globes. Well done, Meryl, and well said. This is my contribution to the movement of fellow artists in a message to people everywhere. We are experiencing fear and concern in so many places, from too much negative and uninformed information, and a message of support is needed. It is my intention to be a voice for truth, love and light in the world. Therefore, I am sharing this with anyone who needs support, wants to share a positive message, and stand up for anyone feeling scared. 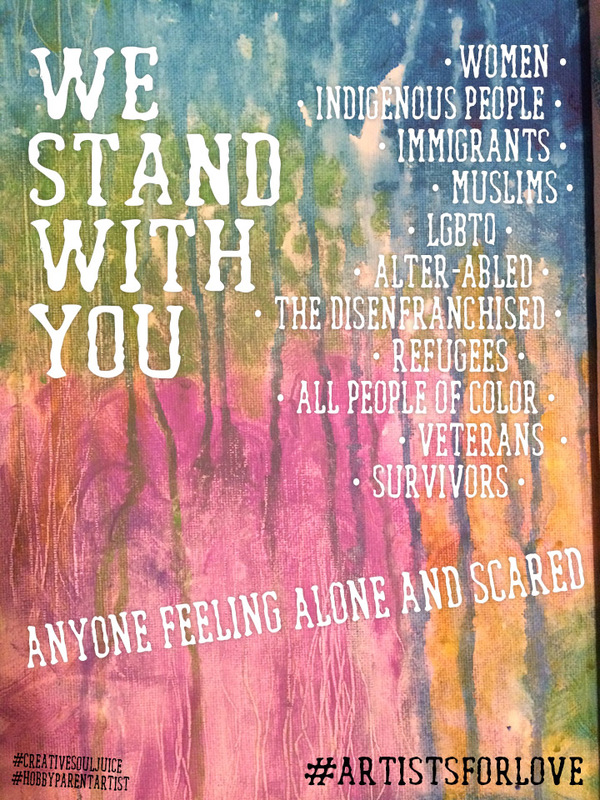 From Flora Bowley’s FB page: “In an effort to foster more love and compassion in the world, a group of my artist friends have created posters expressing our solidarity with those feeling scared and marginalized right now. This project is not intended to create further divide, but rather to build bridges of kindness and inclusivity. Find all the free, downloadable art by Kelly Rae Roberts, Lynzee Lynx Malsin, Alisa Burke, Pixie Lighthorse, Jennifer Mercede, Alena Hennessy, Simone Star, and Orly Avineri, and read more about what it means to me to “stand with” others right now over on my blog. If you feel inspired to join the Artists For Love movement, please download, print, and hang these posters in your community, share them digitally, or create your own versions to share. Use the #artistsforlove hashtag so we can watch this movement of love ripple far and wide!